Step aside Yohan Blake. If you want to meet the real beast of the London 2012 Olympics, look no further than British discus thrower, Lawrence Okoye. The 20 year-old is a former rugby player. Unsurprising given his 20 plus stone and two metre tall frame. But if you thought his position would be as a forward, you would be wrong. Boasting 100 metre times of sub 11 seconds, Okoye earnt his position on the rugby field as a winger, drawing understandable comparisons to the devastating former All Black, Jonah Lomu. In addition to his sporting talents, Okoye is an academic, having deferred his place at Oxford in order to concentrate on his athletics career. “I’ve changed my lifestyle to do this. I was going to go to university after finishing school last summer, to study law at Oxford. I decided to defer for two years so that I could train for the Olympics,” said the youngster. In Monday’s qualifying heats, Okoye’s first throw was distinctly average but then it slowly all started coming together. With one throw left, it was all or nothing for the big fella from Croydon. He summoned all his might and unleashed fury on the discus, launching it 65.28m – a feat which pushed him upto fourth in the rankings, safely securing his position in Tuesday’s final. As soon as the discus left Okoye’s hand, there was an explosion of emotion. Screams, jumps, fist pumps – you name it. If Andy Murray was watching, well, he would have felt a little inadequate. Now all eyes are on Britain’s best thorwing talent since the days of Steve Backley and Mick Hill. 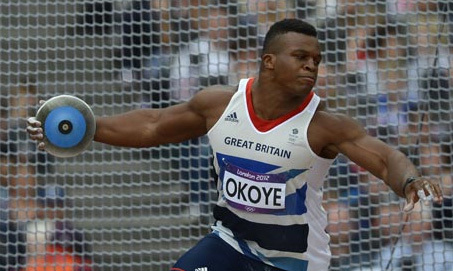 Okoye has the world at his feet and on Tuesday evening, Team GB could very well be saluting another victory.